The Spa at Bedford Lodge Hotel has a wide range of relaxing treatment options, but part of the fun is giving the gift of choice. Whether it’s a birthday present, Christmas gift, employee reward, a gift to celebrate a special occasion, or a simple gesture of appreciation, a Spa Gift Voucher is the perfect thoughtful gift of relaxation and indulgence. The Spa Gift Vouchers, valid for 1 year and can be purchased online here or at the spa reception. Your loved one can spend their gift card right away or keep hold of it for a day when they really need some me time. 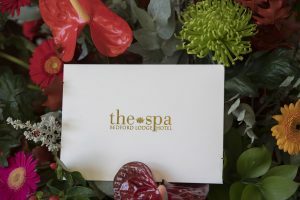 The Spa at Bedford Lodge Hotel Gift Vouchers are ready to give and presented in their own, special deluxe packaging. Each gift voucher can be sent with a personal message and they make fabulous birthday presents, Thank You gifts, wedding or housewarming gifts, Anniversary or Valentine’s Day, baby shower gifts, retirement gifts, graduation presents, Mother’s Day or Father’s Day, and of course for Christmas. Gift Vouchers from The Spa are most importantly completely personal. The Spa has a perfect gift for everyone, and for any occasion.